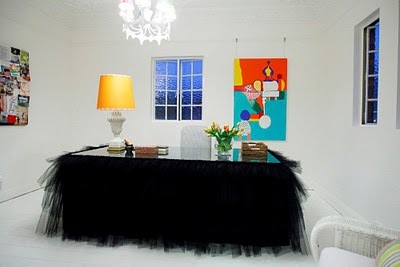 I've seen endless slipcovers for couches, armchairs and consoles, but I don't see them often for office desks, so I squealed with delight when I saw Anna Sprio's Tutu desk at her blog Absolutely Beautiful Things. 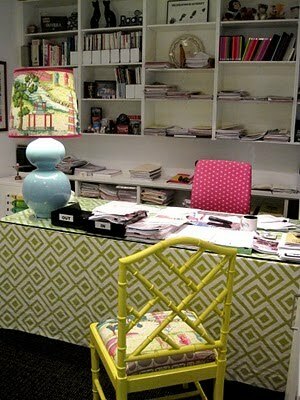 Most office furniture is bland and boring, but her desk slipcover exudes sass and style. Here's another desk slipcover Anna did for a client. Love the bold pattern. I'm dying to see what's on the other side. I'm guessing it's probably one of those affordable but generic tables with plastic top and metal legs. Beds in front of the Window?